I wanted to cook something non Asian tonight so I dug through the freezer and found some Perogies. I figured since I was going with Polish food, might as well cook it with some onions and kielbasa, or Polish sausage. It came out delicious. Begin by boiling the pierogies. While they are boiling, heat up your pan till waters start to roll on the surface and stop evaporating (only follow this if using a stainless steel non teflon pan). When it gets hot enough (the water balls up on the surface), add the oil and swirl it around. It will quickly begin to smoke. Once oil begins to smoke add onions, garlic, and kielbasa. Saute for about 5 minutes or until kielbasa is seared onions are soft. Push to the side of the pan and lower the heat. When Pierogies are done boiling, take them straight out of the boiling water and add to the hot pan. Do not stack them but make sure all the bottoms are touching the pan; this is the same technique I use to cook Chinese Pot stickers. 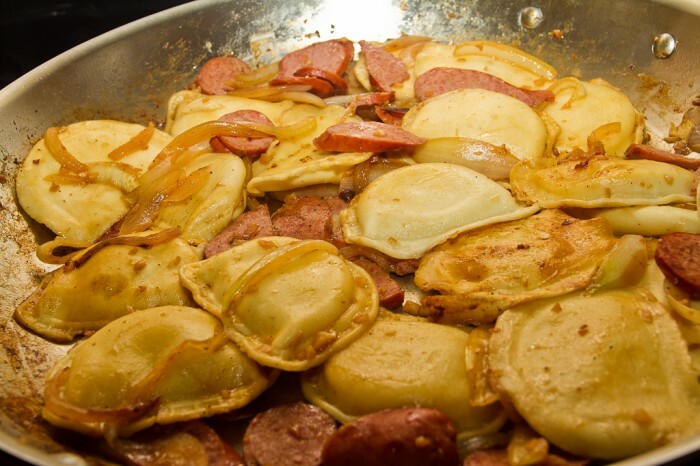 Once all are in the pan, take the onion/kielbasa mixture from the side and cover the pierogies. 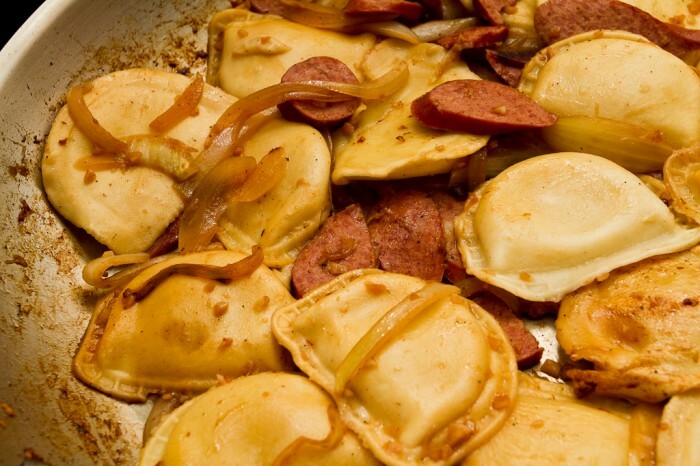 Cover the dish and let cook until bottom of pierogies are crispy/crunchy. Add the wine at the very end before trying to scrape them off or else they will break because of dough sticking to the pan. Once they are loose, season with salt and pepper and serve. You can add Siracha on the side as a dipping sauce and top with some fresh cut scallions. I omitted the scallions this time only because I ran out but normally I add them at the end.